In today's Globe & Mail, Preston Manning asks the question. If you have a heart problem, you go to a cardiologist. If you have an abscessed tooth, you go to a dentist. If the biggest challenges facing your country are economic, who should you put in charge? He's referring to Stephen Harper's degree in economics and thus being the only choice for Prime Minister during an economic crisis. Jack Kevorkian was once a medical doctor too, but I'm not sure I'd go to him for health care advice. That being the case, let's look at another pragmatic Conservative appointment based upon careful examination of their background as to their fitness for their new role. 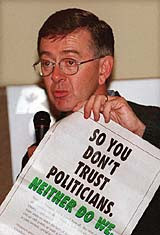 Preston Manning, with a background in economics and the dream of creating a conservative-based political and media infrastructure, was appointed "to provide credible and expert assessments of the science underlying important public-policy issues and matters of interest to Canadians." Apparently, if you have challenges facing your country that are scientific in nature, you turn to a socially conservative economist. Beyond that, if you're looking for credible, unbiased advice on who to select as Prime Minister - look no further than one of his top cronies. Harper's stellar record as an M.A. in economics has also never been sullied by the trivialities of actual work in that field. Clearly, this is the hallmark of the best Economic Minds. In addition to that, the only economics work he did, his thesis, essentially was a work decrying how government spending ramps up right before an election, pointing out how it artificially skews the free market and leads to economic difficulties based on feast/famine behavior. So not only has he not been working in Economics, he's apparantly either forgotten, or disagrees with, what he knew before.. to the tune of 20 billion.